Business groups are able to set agendas and influence government policy via policy planning and advisory groups. Such groups are set up to help governments make policy and are sometimes established by or with the help of business people and even funded by businesses. Reference: G. William Domhoff, Who Rules America? Power and Politics, 4th edn, New York, McGraw Hill, 2002, p. 81.
observe potential members of their inner circle and select appropriate academic experts for promotion within the policy networks and into government service. 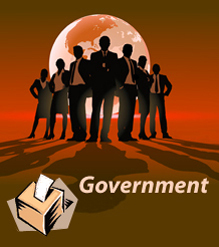 participate in the setting of government policy.